Bishopthorpe claimed a 60-48 victory against Dunnington to top division 2 of the Fulford Ladies Invitation Tennis League, but only by alphabetical order. Those two teams and David Lloyd, who beat Appleton, are all equal on points and games difference. Boston Spa continue to chase after a comprehensive 70-38 win over bottom club Pocklington, which included the weekend’s top score of 33 games from Lesley Bowling and Lorraine Peary. Meanwhile, Rufforth had a narrow 56-52 victory against Castlegarth. Players from Fulford 3, who secured their first victory of the season in division 5. From the left. Janette Richardson (captain), Jane Thresh, Madeline Hatfield and Maggie Middleton. The top two teams and early pace setters in divison 5, both suffered defeats. Leaders, Bubwith, losing 66-42 at Bishopthorpe 2, whilst Wigginton 2 were downed by a consistent performance from all three Dunnington couples, resulting in their 70-38 victory. Despite a 27 game haul from Natalie Muir and Kim Lees, Stamford Bridge were unable to prevent Fulford 3 from claiming their first win of the season. Fulford 2 and Wistow remain unbeaten in division 3, the former having a comfortable 70-38 triumph at Riccall. Cliffe went down 56-52 at Wigginton, in spite of a 26 game haul from captain Jane Pemberton and Emma Foster, whilst Popp lost by the same score to Knaresborough. Wilberfoss remain top of division 6 after a resounding 80-28 victory at Dunnington. High scores by all three couples, including 28 games from Pauline Hull and Christine Thomas, gave Sheriff a colossal 82-26 win against Copmanthorpe, meantime, David Lloyd’s victory over Poppleton moves them up to third. Wendy Stirke and Louise Lister teamed up to bag 32 games for division 1 high flyers York in their comprehensive win against Fulford. Poppleton stay in touch after overcoming York’s second team. Starbeck recorded their second victory of the campaign with a close 55-53 result against Pocklington. Elsewhere, Castlegarth failed to capitalise on the 23 games scored by Sue Jacklin and Rachel Hill, losing 59-49 to Dunnington. Division 4 leaders, David Lloyd, narrowly lost to Boston Spa, Nicola Slater and Margaret Lindley’s 24 games proving a significant contribution in Boston’s win. Copmanthorpe and Tollerton occupy second and third spots after victories over New Earswick and Knaresborough respectively. Castlegarth are still looking for their first win of the season in division 1 of the Fulford Ladies Invitation Tennis League. Lisa Jacob and Helen Halsall took 30 games for Starbeck in their 62-46 defeat of the Wetherby team. Dunnington had a comfortable win over Pocklington, whilst York 2 captain Caroline White and partner Jill Le Pla led a solid team performance to overcome Fulford. Popp’s challenge at leaders York 1 failed to materialise as they were only able to field two couples. Lucy Collier and Sally Simpson claimed 27 games to help guide Sutton to their second victory of the campaign over Knaresborough in division 4. David Lloyd top the table after a straight forward 71-37 victory over Cawood, who could only send two couples. Consistent scoring from all three couples saw New Earswick overcome Boston Spa; elsewhere Cop 1 pair Rhian Scott and Jane Harding amassed 21 games in their win over Tollerton. Wistow’s unbeaten run continues in division 3 as they beat local rivals Riccall 67-41. Cliffe and Fulford stay in touch at the top, both recording victories over Rowntree Park and Poppleton respectively. Dunnington top division 2 after a resounding 82-26 win at Pocklington, which included a 31 game contribution from Emma Loten and Alex Bolam. Bishopthorpe hit form with a comprehensive 78-30 victory over Rufforth, Ellie Page teaming up with regular partner, Laura Rhodes, to bag 29 games. David Lloyd suffered their first loss of the season at Boston Spa; meanwhile, mother and daughter Trish and Angie Bell, were on song to lead Castlegarth to victory over Appleton Roebuck. Division 5 saw Copmanthorpe and Bishopthorpe record the league’s first drawn match of the season. Bubwith remain unbeaten after a 76-32 win over Stamford Bridge, with Liz Bramley and Gill McGrory claiming 30 games. Wigginton and Dunnington also remain in the chase after they both earned 64-44 wins against Fulford and Heworth respectively. Only two matches survived the weather in division 6. Wilberfoss maintained their 100% record with a heavy defeat of bottom team Bubwith. Appleton move up to second place after a 76-32 win against Dunnington which included a 28 game haul from Mary Jane Murray and Cath Temple. 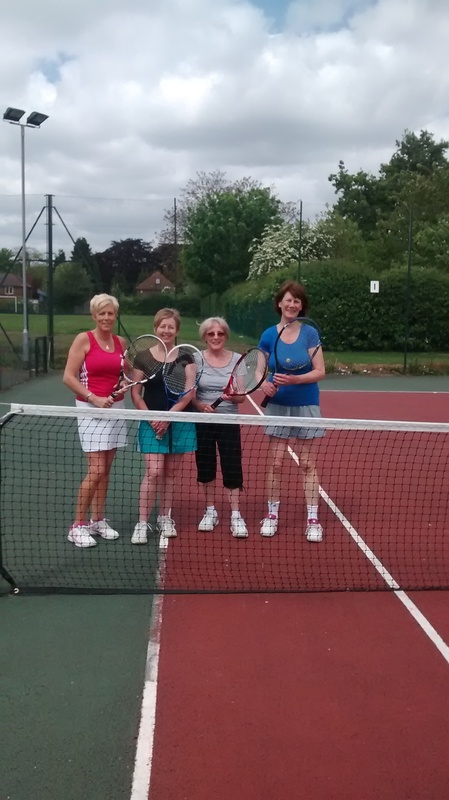 Last season’s two promoted teams, Wigginton and Bubwith, top division 5 of the Fulford Ladies Invitation Tennis league. They both had comfortable wins over Cop 2 and Fulford 3 respectively, with Sandra Burley and Catherine Field contributing 31 of Wig’s 86 games. Meanwhile Bish 2 overcame Heworth by 68 games to 40. The weekend’s closest match was in division 6, where despite a 25 game haul from Appleton’s Julia Campbell and Philippa Gill, their team just lost out by a couple of games to David Lloyd. Dunnington have already equaled their win tally from last season by defeating Sheriff Hutton 64-44. Bishopthorpe and Boston Spa both recorded their first victories of the campaign in division 2, the former at Pock and Boston at local rivals, Castlegarth. Frances Mutter and Louise Dwyer bagged 32 games in David Lloyd’s comprehensive 87-21 defeat of division 2 newcomers, Rufforth. A tight finish in division 3 saw Knaresborough just miss out at Riccall, going down 56-52. Elsewhere Lorraine Waudby and Sarah Blacker scored 28 of Wig’s 65 game haul against Rowntree Park. Wistow’s winning run continued with a 61-47 victory against Popp 2. Division 1 saw Poppleton inflict a heavy defeat on Fulford, where once again, Rebecca Turnbull and Catherine Baker top scored with 32 of Popp’s 74 game total. Youngster, Rebecca Hill and partner Vicky Bland won an impressive 27 games to ease Pocklington to a 57-51 victory at Castlegarth. New Earswick got their division 4 campaign up and running with a resounding 71-37 triumph at Knaresborough, captain Maz Broadbent and partner Lisa Debenham leading the way claiming 29 games. Meantime, David Lloyd had a comfortable 61-47 win at Cop and Tollerton overcame Cawood, who were only able to field two couples. A solid team performance from division 1’s defending champions, York 1, avenged their defeats against Dunnington last season with all three couples making a positive contribution in their 63-45 victory. The weekend’s top scorers were Popp’s Catherine Baker and Rebecca Turnbull (pictured below), who claimed 30 games to ensure their team got off to a winning start at Castlegarth. League newcomer, Wendy Wong, contributed 21 games with partner Anna Baker in Fulford’s 67-41 win over fellow promoted Starbeck. Newly promoted Appleton started their division 2 campaign with a 59-49 victory over Bishopthorpe, with Judy Marriott and Emma Cashmore notching up 24 games, whilst David Lloyd 1 opened their season with a 65-43 win over Pocklington 2. In division 6, Wilberfoss again benefited from the high scoring partnership of Gerry Screeton and Michelle Helm who contributed 29 games in their 69-39 triumph over David Lloyd 3. Meanwhile Poppleton scored a resounding win over Dunnington 4, whilst the league’s newest team, Bubwith 2, went down 62-46 to Sheriff Hutton. Division 4 saw David Lloyd 2 complete a comprehensive 72-36 victory over Knaresborough 2 which included a 25 game haul from Barbara White and Sarah Cussons. Meantime, Cop 1 had a comfortable 70-38 win at Sutton. Bubwith 1 started their season in division 5 with a 68-40 win over Cop 2. Elsewhere, Dunnington 3 recorded an emphatic 71-37 success over Fulford 3. The two teams that dropped into division 3 met in the first week of the season, where Fulford 2 came out victorious with a 65-43 win over Knaresborough 1. Jane Pemberton and Nikki Jackson scored 25 of Cliffe’s 57 games to defeat Riccall, whilst Wistow overcame Wig 1 by 58 games to 50.